Michelle Lee, a senior fashion design major in the College of Visual and Performing Arts’ School of Design, was named a 2016 YMA Fashion Scholarship Fund (FSF) Scholar. Lee is now a two-time recipient of the $5,000 scholarship; she was also named a YMA FSF Scholar in 2014. Michelle Lee ’16, right, with Syracuse University’s YMA FSF liaison, Rose Marie Crisalli, at the YMA FSF Geoffrey Beene National Scholarship Awards Dinner. 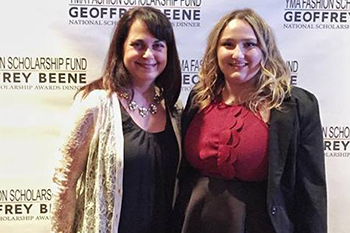 Lee and her fellow scholars were honored in January at the YMA FSF Geoffrey Beene National Scholarship Awards Dinner in New York City, which is attended by fashion industry executives. Scholars also participated in an educational conference and career fair. The scholarships are awarded to students at member universities and are based entirely on merit, taking into consideration the applicant’s GPA, the completion of a case study project, a personal essay and an interview with a YMA FSF ambassador.